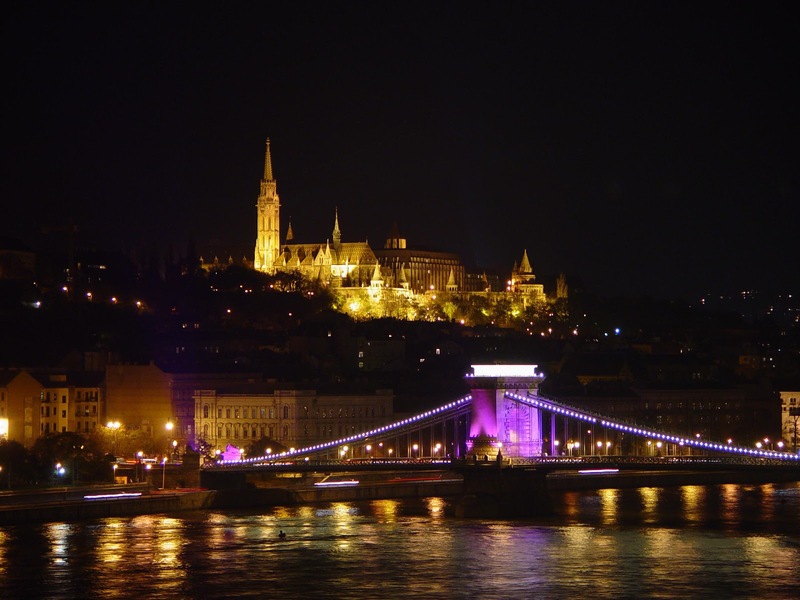 Cruising into Budapest, Hungary, by night revealed a contrasting panorama of gold against the darkness of night. All photography is the property of EuroTravelogue™ unless noted. Unauthorized use is prohibited. This photo only: WikiMedia.org. Welcome to the February edition of ArtOdysseys—my ongoing series that unites my love of travel with discoveries in art along the way. This month, my focus "contrast" and having just returned from my Danube River cruise with Viking River Cruises, we traveled through four countries from Germany to Hungary and along the way, discovered many interesting compositions offering striking contrasts in art, architecture and the natural beauty of the landscape. We began our eight-day voyage in Dreiflüssestadt (City on Three Rivers) or Passau, Germany, perched on a spit of land where the river Danube meets the rivers Ilz and Inn. On the eve of our first night in port, I set out to explore the city with only my camera in hand and no one in tow. 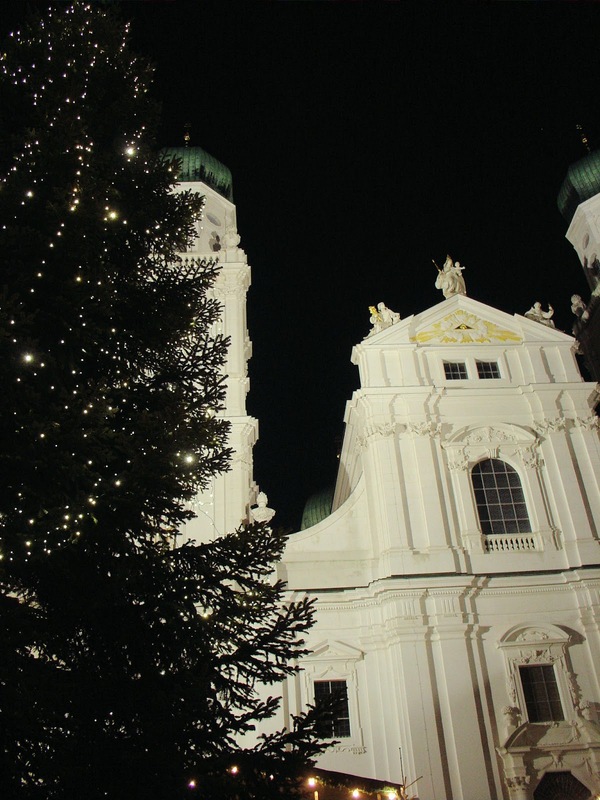 Saint Stephan's Cathedral in Passau provided a striking contract of the white cathedral against the velvety night. As I wandered the cobbled streets up to the cathedral square, I stumbled upon this striking image of Saint Stephan's Cathedral—not only a contrast of its white exterior set against a black velvet night, but by day, it's a contrast in architecture—a composition of Gothic and Baroque due to a fire that destroyed most of its earlier self. Much of what we see today dates to 1688. 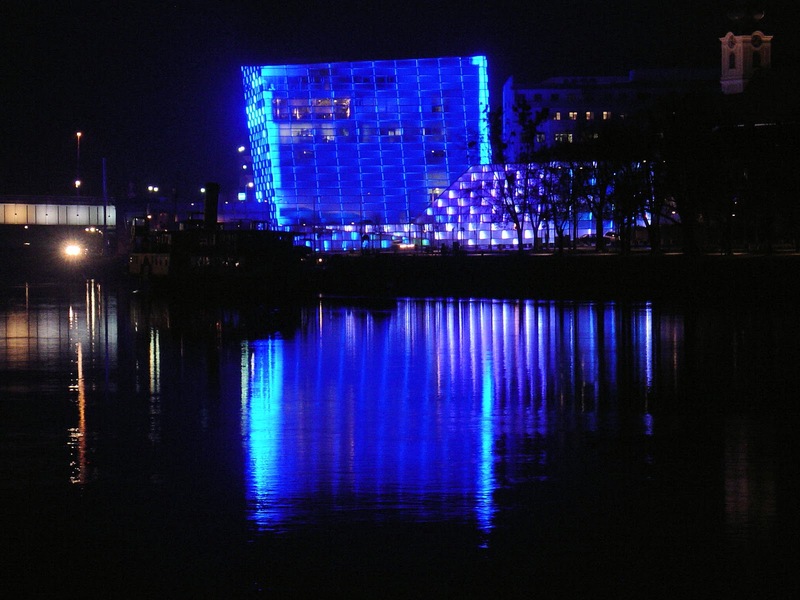 The Institute of Computer Graphics in Linz, Austria, was a dazzling display of neon light. Upon arriving in Linz, Austria, sometime in the middle of night, I awoke prematurely and took a peek outside to see our new surrounds. My eyes were met with a striking composition of alternating neon colors vibrating in the darkness of night. As it turned out, this was the exterior of the Institute of Computer Graphics. Later that morning, we were off to Salzburg, about a two-hour journey from Linz. Along the way, we stopped at a rest area where the dramatic scenery of Alps unfolded before our eyes—a sweeping panorama of a striking composition of craggy slopes laden with snow and the softness of the green grass in the foreground. 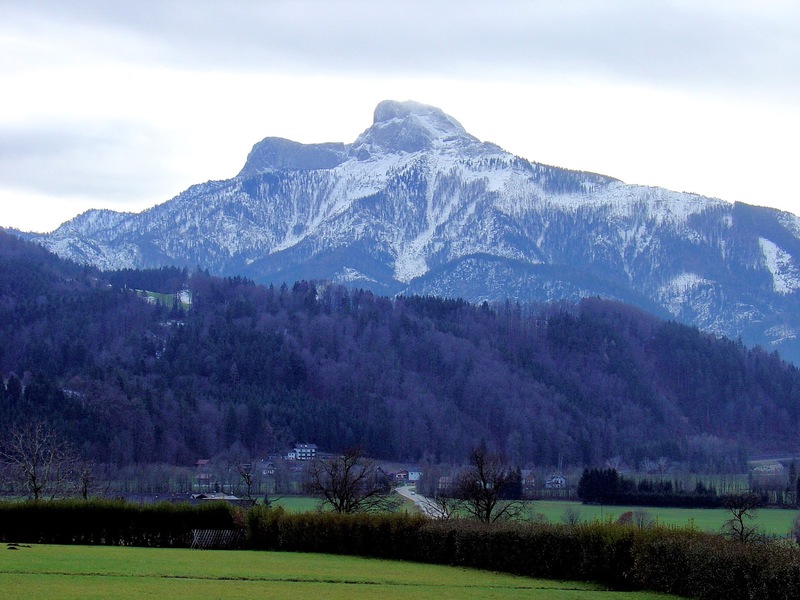 En route to Salzburg, Austria, we stopped at a rest area for a wonderful preview of the Alps! 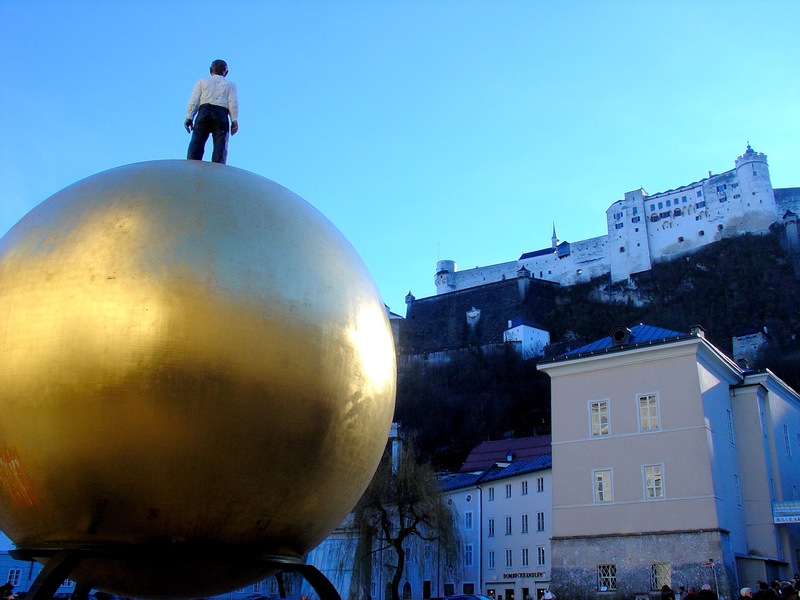 While on our walking tour through the "Old Town," we strolled through Kapitelplatz or Chapter Square where we stumbled upon this dazzling golden globe with a little man at the top—"Sphaera." This remarkable sculpture is the work of resident artist Stephan Balkenhol who completed this commission in 2007 as part of a 10-year program launched by a consortium of art benefactors who organized one piece of contemporary art to be installed throughout Salzburg every year starting with 2002. "Sphaera" and the imposing 11th-century fortress, Festung Hohensalzburg atop the hill in the background, comprised an unusual contrast of very different shapes and times. A contrast of time—the "Sphaera" and the 11th-century Salzburg Fortress. 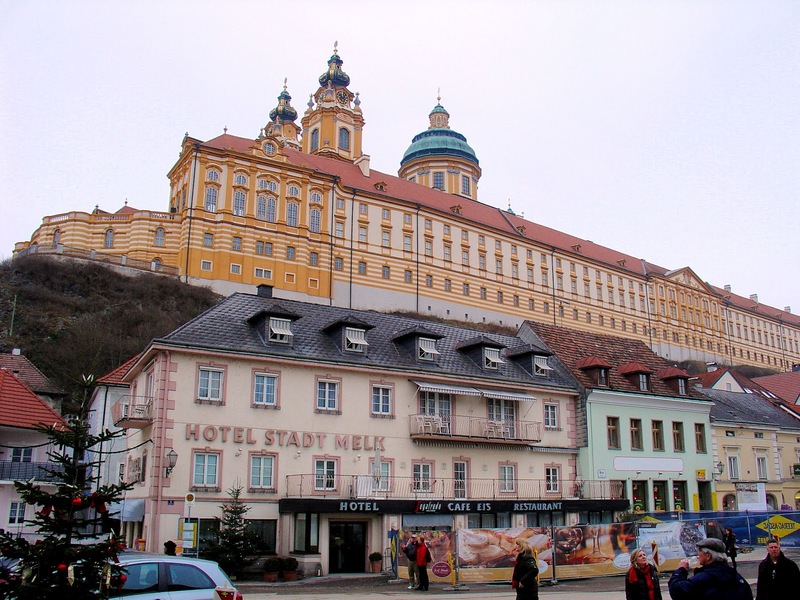 The imposing Melk Abbey looms over the tiny village of Melk below. Along our Danube river cruise, the fourth day brought us to Melk, Austria. 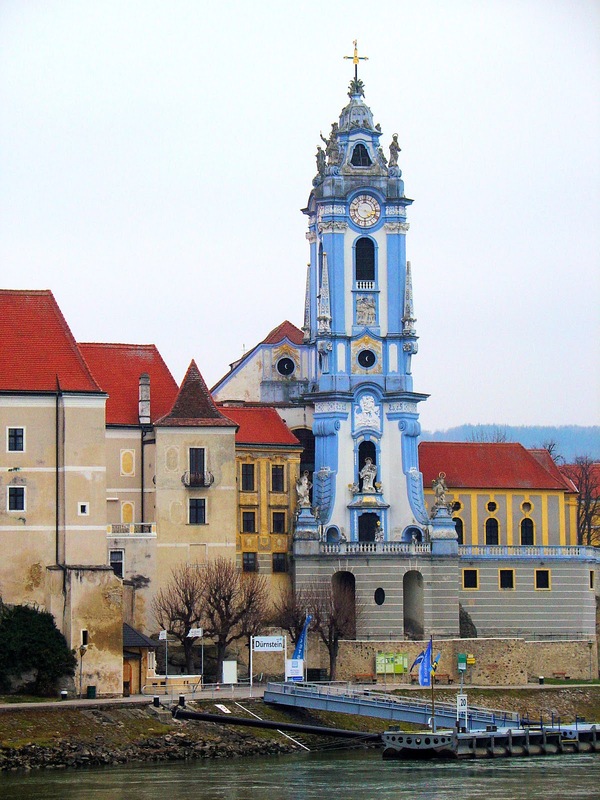 In the morning, we set out to explore the majestic Melk Abbey perched upon its rocky bluff for almost 1,000 years. What struck me about this magnificent scene is its incongruousness between the Baroque exterior of the Abbey and the medieval town below. How this picture came to be was a happy accident actually. As I was wondering through the village after my decent from the Abbey, I turned around to see this incredible view—and gasped! The vibrant colors of some of the buildings in Dürnstein provided a stunning contrast to the bleakness of winter along the Danube River. Later in the afternoon, we enjoyed a cruise through the beautiful stretch of the Wachau Valley replete with villages, castle ruins and vineyards. Our destination was Dürnstein, an enchanting medieval village where Richard the Lion Heart was imprisoned in the Kuenringerburg Castle at the top of the hill in 1192-1193. 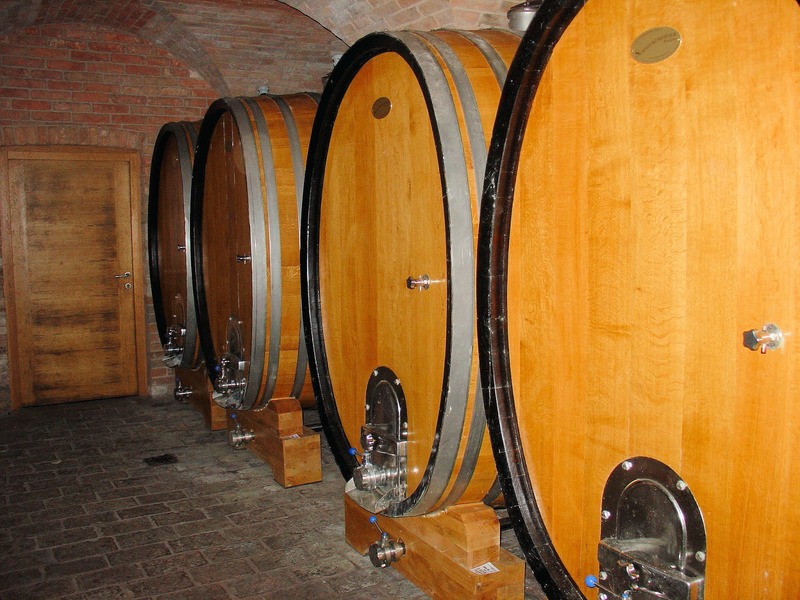 A harmonious blend of contrasting materials in this view of wine barrels at the Winzer Krems Winery in Dürnstein. After we disembarked, our group set out for a wine tasting at the Winzer Krems Winery whereupon arrival we learned of the Austrian wines, the terroir, toured the cellar and attended a tasting of country's renowned vintages. During the tour, this interesting composition caught my eye—the rich amber tone of the barrels, the metallic bands, the cobbled flooring and surrounding brick blended so rustically, so harmoniously. 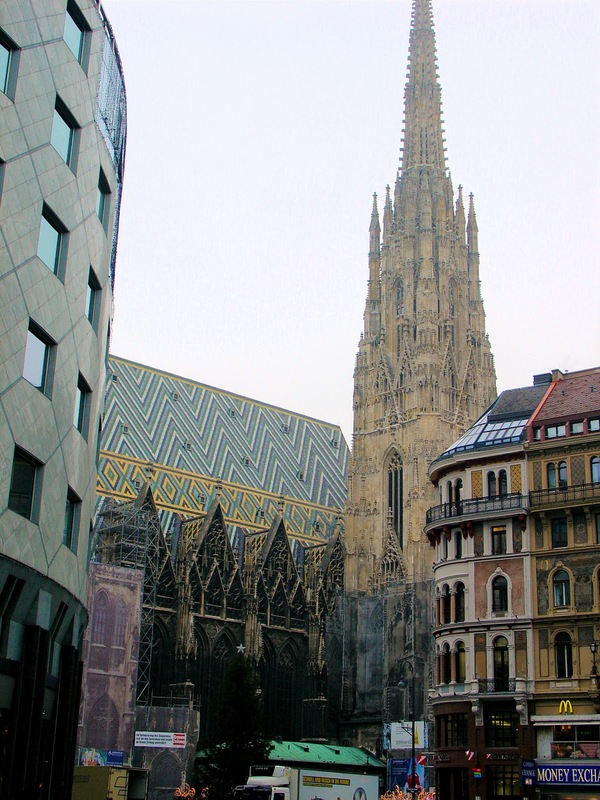 The Haas Haus at the left has become a controversy in the city of Vienna due to its modern architectural style juxtaposed with Saint Stephan's in the background. Look deeper, and more contrast in the geometric patterns on the roof. What has certainly become a controversy within Vienna since its completion in 1990 because of its juxtaposition to nearby Saint Stephan's Cathedral, the Haas Haus is a harmonious blend of curvature and glass when viewed alone, however, it seems out of place when viewed against the backdrop of the European-Gothic edific across Stephansdom or Saint Stephan's Square. Magnificent architectural details of the Spanish Riding School in Vienna, Austria. 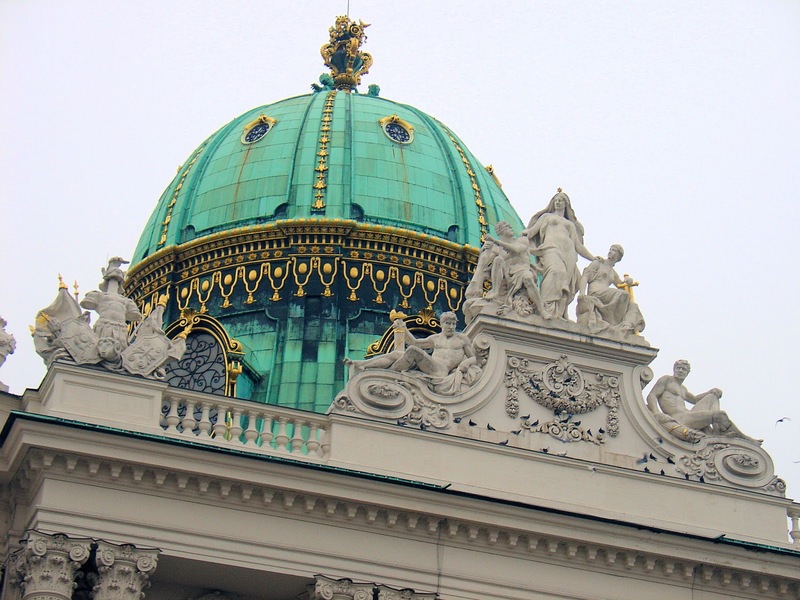 Adjacent to the Hofburg Imperial Palace, the Spanish Riding School offers a vibrant contrast in its patina dome and stark limestone façade. Dating back to the middle of the 16th century, the Spanische Reitschule was originally intended to be the personal residence of Maximilian II but he ascended the throne before it was completed and therefore settled into the old Imperial Palace. Inside the school today, you'll find 72 Lipizzaner stallions, such noble creatures of grace and elegance. Budapest was a city of gold upon our arrival by night. Photo: WikiMedia.org. Our last stop on our Viking Christmas market cruise landed us in the capital city of Hungary—Budapest. On the night of our arrival, Viking invited us up to the top deck of the ship, mind you it was a wintry night and very cold, to experience our arrival into city. Suddenly out of the darkness, emerged Budapest—all of the sights unfolded before our eyes—magnificent architecture aglow in a city of golden light—a sprawling scene surrounding us on our ship and making us feel quite small. 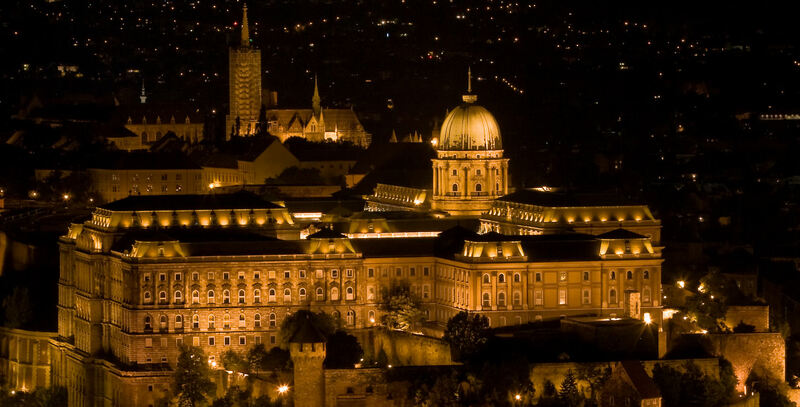 We were captivated to say the least and awe-struck as we scanned the horizon to see the Neo-Gothic Parliament building, Buda Castle, Fishermen's Bastion—among others! This experience was absolutely one of my "revel in the moment" moments, so to speak, where I wanted time to stand still. As my spirit soared, I soon forgot how cold it was outside. Looking back, I think my cup of glühwein may have had something to do with that as well. 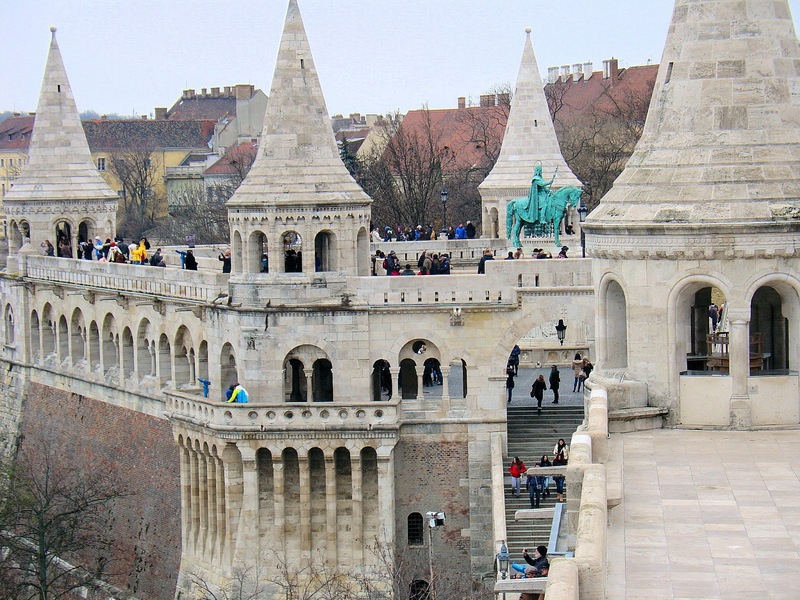 Our morning tour the following day led us to the Buda side of the Danube River where we toured the Saint Matthias Church and adjacent Fishermen's Bastion. 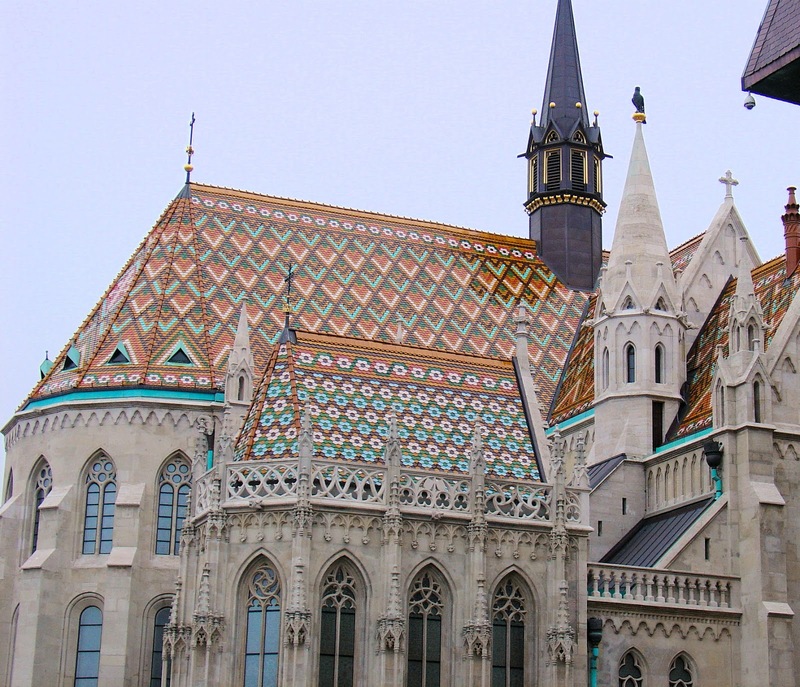 Exquisite diamond patterns adorn the roof of Saint Matthias in Budapest, Hungary. The vibrant geometric pattern on its 19th-century roof betrays the cathedral's origin which dates back to the middle of the 13th century—once again revealing a contrast in time. 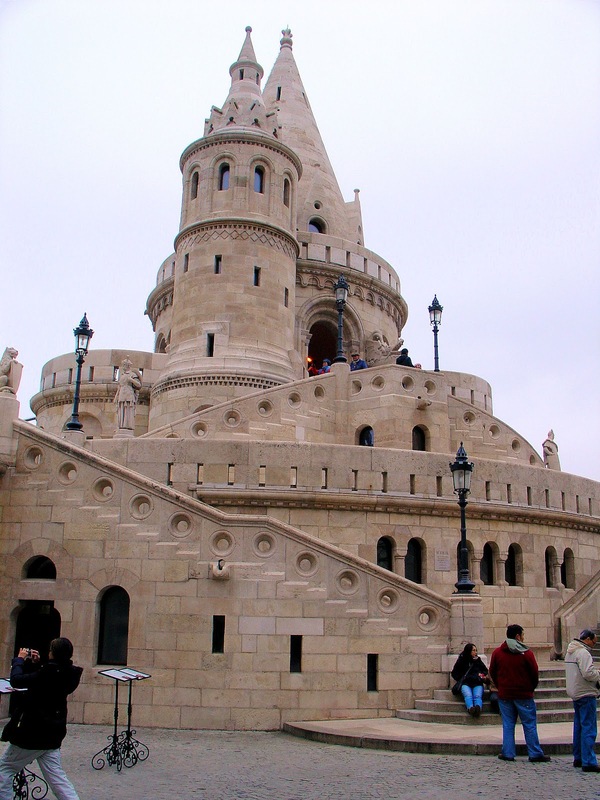 Fanciful designs of the 20th-century Fishermen's Bastion in Budapest, Hungary. Located just behind the church is Fishermen's Bastion, a fairy-tale composite of turrets, spires and romantic arches offering some of the most spectacular scenery of Budapest. This fanciful structure represents contrast in time—although it looks to be of medieval origin, it was constructed at the turn of the 20th century and named for the fishermen who guarded these ramparts in the 18th century. The rear view of Fisherman's Bastion reveals the old castle ramparts that served as the base for the fairy-tale structure. Note the statue of King Stephen (István). Once again, I would like to give special thanks to my friends at Insight Guides whose books proved to be an invaluable resource during my visit to Europe and in providing the background information for this and many other articles. Above all, my heartfelt thanks to Viking River Cruises who made possible this voyage to Europe at Christmastime. Of course all opinions and thoughts reflected are mine, and mine alone. Thank you Viking Cruises for a magical Christmas holiday! You can find ArtSmart on Facebook too! Fantastic! I love the contrast of the modern art sculpture and the fortress in Salzburg. And your description of seeing Budapest for the first time sounds magical!! Hi there Christina!! I just love to read your comments...such a joy! Thank you for all of your kind words too, they mean a lot to me! I love the subject of "contrasts" and really like how you chose to present it. Wonderful selection of places. The tile roofs of St. Stephan's and St, Matthias are so gorgeous. I had been to Vienna before Budapest and remember being so surprised by that kind of style. Then to find it again in Budapest was a real treat. Your post also has me anxious to return to Europe and some of those very same cities. Hi Cathy! Boy coming up with a subject for 'contrast' certainly was challenging so I wasn't sure how this was going to come out. After I started though, I really started enjoying myself as I wrote and searched for these and many other contrasts during my journey! And I hear you about wanting to return, I was somewhat wistful as I typed away but soon a smile overcame when I was reminded of the wonderful times I had there! Thank you so much for stopping by. Great pleasure to read this post! I think that modern architecture in old European cities is very controversial theme, especially if there is a new idea to fill an empty slot in the city center and people don't agree with that. While I love modern architecture I think it is very very hard to construct it along the old and listed buildings and - frankly - rarely a success. Did you have an opportunity to visit Hundertwasser buildings in Vienna? In any case it is always worthy to read and think about it. Great post Jeff! Greetings Agata! Thank you so much for your kind words! Alas, I did not see the Hundertwasser buildings but you certainly piqued my curiosity, that's for sure. Thanks for stopping by and sharing your thoughts! Beautifully executed, Jeff. I love the contrasts of colors, scenery, materials. It's a delicate balance to mix old and new, maintaining the integrity of the two takes discernment and daring -- but your examples show that it can be done. Hi Marcia. Thank you my friend for your kind words, I really appreciate it. I think this will become one of my themes in my travels...the old and new sharing the same space and time. It truly fascinates me! Thx for stopping by to share your thoughts! Wow, what an awesome experience. I can't wait to travel Europe more. I've only taken a couple of river cruises because they've never been a big draw for me but boy am I missing out!! Hi Doug! Thank you so much for stopping by my friend. Indeed you need to take more river cruises. As you know, the overall quality of the experience is incomparable! I love it! Ciao Freya! I totally agree with you my friend! I loved Fishermen's Bastion for its fanciful structures!! It was fun visiting and the views of Budapest from there are unsurpassed. Thank you so much for stopping by! Hi Lesley! LOL! Too right you are my friend! Thank you so much for stopping by and sharing your thought!! Wonderful photos and a very interesting discussion of contrasts, Jeff! I hope to see all of these myself some day! Thank you so much Lisa! I really appreciate your kind words and stopping by to share your thoughts!! And don't worry, you will see them all!! Hi Mike! So glad she picked Salzburg for you!! You will absolutely love it. I have another post on my site all about my visit to Salzburg so I hope you check it out. Thanks so much for stopping by and sharing your thoughts! I love personal comments like this! Wonderful post, Jeff and gorgeous pictures. I love seeing all the contrasts you presented here and one I never really look for despite visiting some of these cities recently. Vienna and Budapest just look so amazing. I'd love to see Fisherman's Bastion and the Spanish Riding School one of these days and just stare in awe. Hi there Mary! You really must go to all of these places some day!! They really are magical and during Christmas, positively enchanting! Thank you so much for stopping by and for your kind words!! What a great post. I love the contrasts in color and vibrancy. I, too, love the blue churches that do stand out in Eastern Europe. Beautiful! Hi Corinne. Thank you for your kind words and comments my friend! I was in awe at all of the sights we cruised to! Simply amazing! I love the way you've chosen to illustrate contrast. What great subject material you had to work with as well.The Institute of Computer Graphics really lights up the night sky - and a very cool shot it is.Enjoyed all the different forms of architecture you've shown too. Greetings to you Leigh! Thank you so much for your kind compliments! I really appreciate that! The funny thing is that I struggled with this topic for quite sometime until I honed in on the inherent contrasts found throughout my journey. The more I wrote, the more I got into the subject matter. And, I agree you on the Institute, that blew me away as I watched the never-ending cycle of neon play out before my eyes! Thank you for stopping by! The roof of Saint Matthias Church is gorgeous! My husband's parents are taking a cruise from Copenhagen to Russia this summer and I'm super excited for them. It looks like a fantastic way to tour through Europe (and it looks like you had a wonderful time). Hi Ashley! I couldn't agree with you more. And St. Stephen's in Vienna is equally magnificent! I have never seen roofs like these until I visited these cities. Just incredible! What line are you in-laws sailing on? Sounds like a fantastic voyage indeed. Thank you so much for stopping by to share your thoughts! I really loved seeing the photos of Austria - it is definitely on my radar of places to visit. Love the mountains and the city views! The river cruise sounds like an amazing way to see many places in Europe! HI Lauren and thank you for your kind words! Definitely add Austria to your list, you won't be disappointed, I promise you! And you know me, I can't laud river cruising enough! Beautiful photos. I always wanted to take a Danube cruise, but since I have an apartment in Budapest thought it might better to just use the train instead. After reading your post I might do it. Hi there my friend and thank you so much for stopping by. Absolutely make the trip, you won't regret a single moment. Thanks so much Charu!! It was an amazing voyage, one I will remember forever! Thank you for stopping by and your kind words! I recently visited Salzburg, Melk and Vienna; I absolutely loved my time in Austria. I'd like to continue down the Danube with a stop in Budapest. Hi Brianna!! Thank you so much for stopping by and sharing your experiences!! Definitely plan to extend your visit next time all the way to Budapest and beyond!